Tim Bogar worked to give Tampa Bay Rays manager Joe Maddon all the information he needed in 2008. Helping him with one portion of that, according to The Sarasota Herald-Tribune was Rays advance scout Elanis Westbrooks. Westbrooks, The Herald-Tribune wrote, scouted the next team the Rays played. "Make sure there is nothing that is not covered," Bogar told The Herald-Tribune that June of his conversations with Westbrooks. "Make sure there are no surprises." Westbrooks scouted for the Rays in 2008 as a continuation of a scouting career that stretched almost since the days he was scouted himself. Westbrooks became a scout after a professional playing career that lasted four seasons, but never made it above AA. Westbrooks' professional career began in 1987, taken by the Giants in the 47th round of the draft out of the University of Texas. Westbrooks chose Texas out of Bellaire High in Houston, turning down a 7th-round selection by the Yankees in 1983. At Texas, Westbrooks helped the Longhorns to the 1987 College World Series, two wins from the title. In the game in which Texas was eliminated, Westbrooks hit a home run. With the Giants, Westbrooks started at rookie Pocatello, moving to single-A Fresno. Between them, Westbrooks got into 43 games, hitting .272. He moved to single-A Clinton for 1988, hitting .231 over 100 games. In 1989, Westbrooks hit single-A San Jose, hitting .231 again. 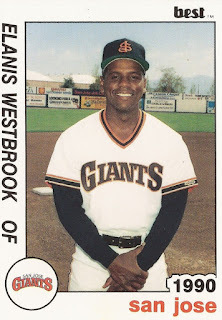 For 1990, Westbrooks returned to San Jose, moving to AA Shreveport mid-season. At Shreveport, Westbrooks got 31 appearances, hitting just .208. They were the last appearances of his career. By November 1991, Westbrooks had started his new career as a scout, named by the Giants as a territorial scout. By May 2000, Westbrooks was an advance scout with the Brewers. He moved to the Padres in 2003, then to the Rays by 2008.